No matter which platform and which technology you use while developing an application, there are lots of tools on the Internet that can help you design its appearance. Actually, the product design and the user experience they provide play a much more important role than just being a set of functions. Interestingly, there is no need to buy anything in most cases. Many tools that useful for UI/UX designers are free to use. Of course, to solve complex issues, it would be best to use a paid product. However, we are sure that many of you will find our list useful in your everyday work. Wheel is a minimalistic and very convenient tool meant to create a color circle (color wheel), which can be useful for any designer. The app is available on Github here. 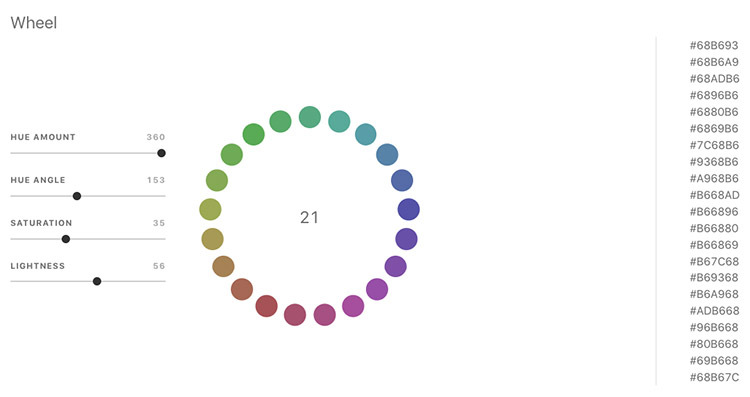 Get the color hex code. 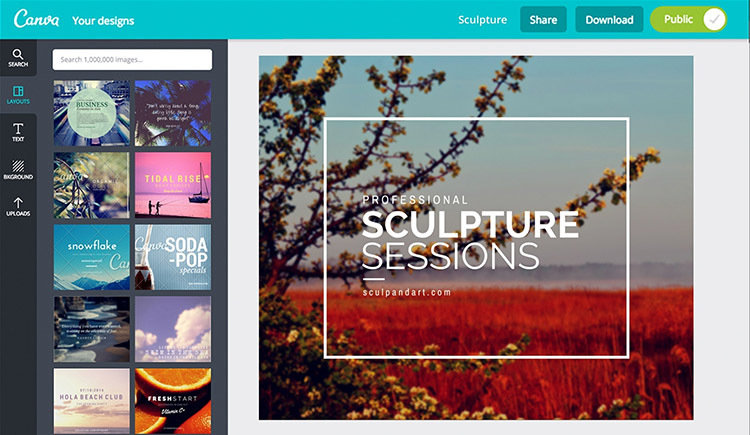 Canva is a multifunctional platform used to create various design elements, allowing you to create logos, presentations, banners for social networks, covers for e-books, as well as the design for mail-out messages, advertising banners, etc. So, you can use the service to create graphics that can be applied both in the application itself and for other uses, such as for marketing purposes. Canva gives you free rein. Each separate layout fragment can be moved, resized, rotated, and experimented on using color and transparency settings. To create an individual design, you can add more elements like texts and images, which are abundantly available in the gallery. A memorable application icon, attracting attention more than anything else on the device screen and in the catalogue, is an important thing to remember when developing an app. One of the icon’s functions is to visually tell people what they can expect from the application itself. Iconfinder is a huge collection of various icons, and most of them are absolutely free of charge. You can download them in different formats and different resolutions. Using specialized tools, you can easily create a cool prototype website or mobile application even if you are not a professional designer. One such tool is Moqups. Moqups allows making both a rough sketch, giving a general idea of ​​what the future application will look like, and the most elaborated detailed design that can be used to create the final product. You have a canvas and a set of various ready-made elements (stencils), which can be placed on the canvas any way you like. It can be simply done by dragging elements, using the drag-and-drop algorithm. The free version allows you to work with one project with a total size of up to 5 Mb and to use up to 300 details. Color is essential to human life, and this is true in relation to almost everything that surrounds us. When making a design, it is necessary to select colors that will attract attention to the product and inspire specific impressions and emotions in the customer. Do you have a hard time deciding on a color scheme? 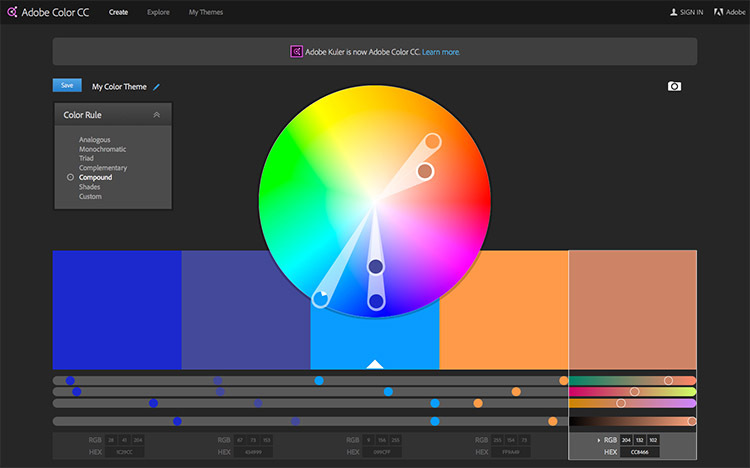 Adobe Color CC allows you to choose colors based on any downloaded image, or use a pre-prepared palette of color combinations. A collection of successful, regularly updated design solutions for mobile interfaces is presented in this app. 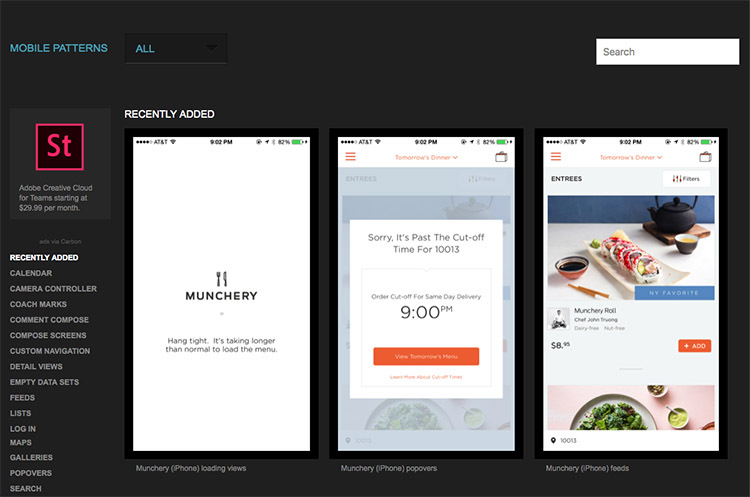 Mobile Patterns will help you cope with your creative crisis, or just find perfect solutions for your product. On this website, everything is sorted clearly in categories like calendars, lists, maps and settings, which is a great advantage when working with the app. 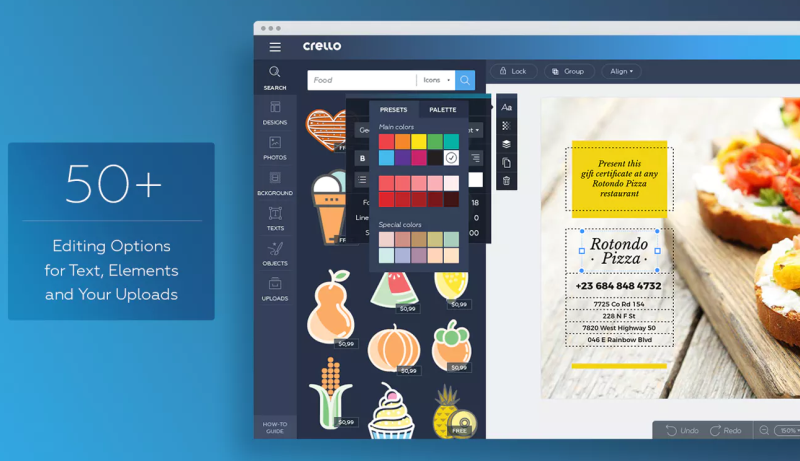 Crello makes graphic design comprehensible and simple. Crello’s library contains more than 10,000 free templates, 400 free fonts, and 65 million images. The graphics can be created in 30 formats, from a Twitter cover or Instagram post to a full-fledged poster. For example, using the “frames” function, you can create professional-looking designs in just a few steps, blending photos in frames and simple shapes, harmoniously combining several images into one, and so on. 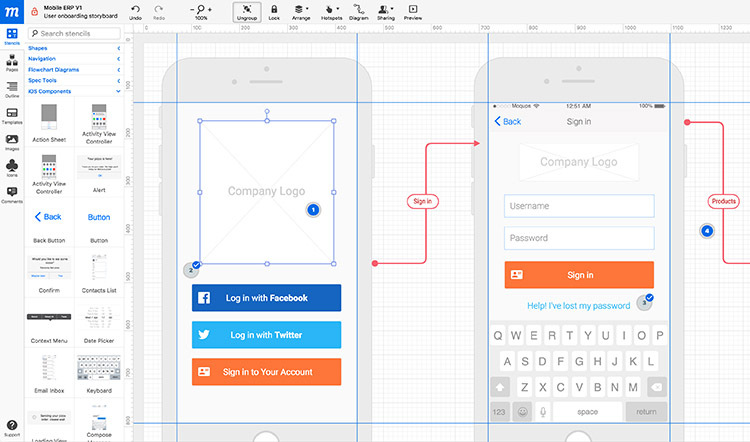 Making a design in Crello takes 10 to 15 minutes, even if you are using it for the first time. All you have to do is to choose a format, pick the template you like, and add your own text and image. Using good tools makes life easier for a specialist of any field, be they a designer or a developer. We hope our selection will be useful to you. However, if you decide to proceed from an idea to a practical product development, feel free to contact us. We are always ready to become a reliable technology development partner for you!